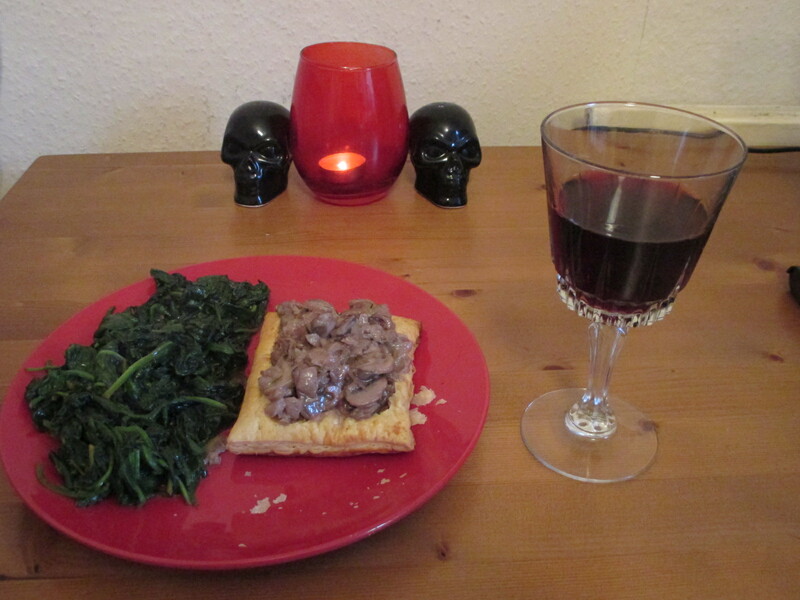 For Valentine’s Day this year we cooked Mushroom Puff Tartlets with Balsamic Spinach. They are delicious and soo easy to make! It takes about 20 minutes to prepare all the ingredients and about 35 to cook it. This recipe serves 2 and it would go very well with steak or Salmon. Pre-heat the oven to 200C/fan 180C/gas 6. Roll out the pastry to about the thickness of a £1 coin, then cut out 2 x 12cm circles using a cutter, or by scoring around a saucer (I made them square because I couldn’t be bothered and it really doesn’t matter). Score 2cm from the edge and prick the pastry inside the border. Lift onto a baking tray, then bake for 20-25 mins or until golden and puffed. Press the risen middles down a little, ready for the filling. Can be made a day ahead, then reheated in a hot oven. Heat the oil in a pan, add the shallots, then fry until softened. Add the mushrooms and thyme, then fry until mushrooms are softened and any liquid almost gone. Add the port or Madeira or wine, then bubble for 2 mins. Add the cream, simmer for 1 min more until the sauce is slightly thickened, then set aside. Wash spinach leaves thoroughly, removing any tough stalks. Set the spinach leaves in a colander, then pour over boiling water from the kettle until all the leaves are wilted. Press out as much liquid as possible with the bottom of a saucer. Heat a drizzle olive oil in a pan, add the spinach and a splash balsamic vinegar, season well, then warm through. To serve: Pour the mushroom mixture on top of the puff tartlets, you can have the spinach on a side as a main dish or do it chef-style and pile everything up on top of the tartlets. See both examples below. Hope you enjoyed this, it is a truly delicious recipe! 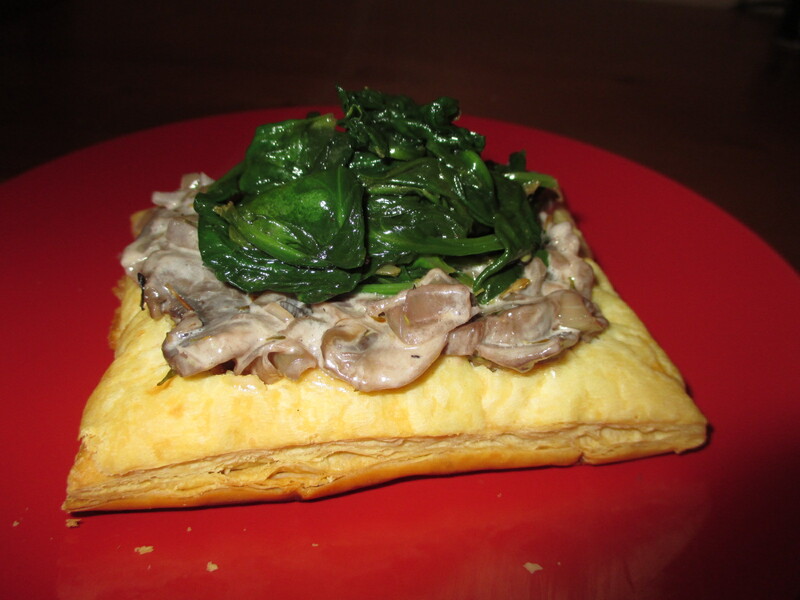 This entry was posted in Cooking and tagged Balsamic vinegar, mushrooms, puff pastry, Spinach. Bookmark the permalink.